It is worth remembering that the full name of the place discussed here is Arsameia on the Nymphaios, as it distinguishes this location from the other Arsameias - on the Euphrates, now known as Gerger. Both Arsameias owe their name to King Arsames from Armenia. He reached for power around 260 BCE, in the turbulent period of the Syrian Wars. They were fought between the Seleucid Empire and the Kingdom of Egypt ruled by Ptolemies, that is between the states that were the heirs of the vast but short-lived empire of Alexander the Great. The Syrian Wars took place in the Coele-Syria, covering the territories of Syria and southern Anatolia, in the third and second centuries BCE. This long-lasting conflict was a huge burden on both sides, depleted their human and material resources, and enabled local rulers to make successful attempts to gain control over fragments of the theatre of war. One of them was Arsames, who founded the Kingdom of Commagene. Of course, all these local disputes ultimately led to the conquest and division of contentious areas between Rome and Parthia. The figure of Arsames, the founder of both Arsameias, is shrouded in mystery. We get to know him thanks to the inscriptions discovered in Arsameia on the Nymphaios. Most probably, he can be identified with the king of Armenia, described by the Greek author Polyaenus, who supported Antiochus Hierax - the younger brother of King Seleucus II Callinicus. Antiochus rebelled against him, won the battle near Ankara, but eventually lost the war for power, and fled to Egypt, where he was murdered by the robbers. The construction of Arsameia's fortress by Arsames would be justified in this light by the ongoing military activities against Seleucus. Commagene appears again on the pages of history around 160 BCE, when the Seleucid Governor of Commagene - Ptolemy - decided to become independent from his superiors and made Commagene an autonomous kingdom. This Ptolemy derived his origins from the Persian king Darius the Great. His descendant, King Mithridates I Callinicus, had Hellenistic inclinations. He allied with the Seleucids and married the daughter of King Antiochus VIII, Laodice VII Thea Philadelphus. Their son ascended to the throne of Commagene as Antiochus I Theos Dikaios Epiphanes Philorhomaios Philhellen. Thanks to the royal origins of both parents, he could be proud of his splendid pedigree. However, most probably he would have been completely forgotten, along with his kingdom, were it not for the building program he initiated. It is thanks to his crazy vision that you can now admire the sunset on Mount Nemrut in the company of monumental statues. In addition, it was Antiochus I who erected a hierothesion in Arsameia for his father, King Mithridates I. 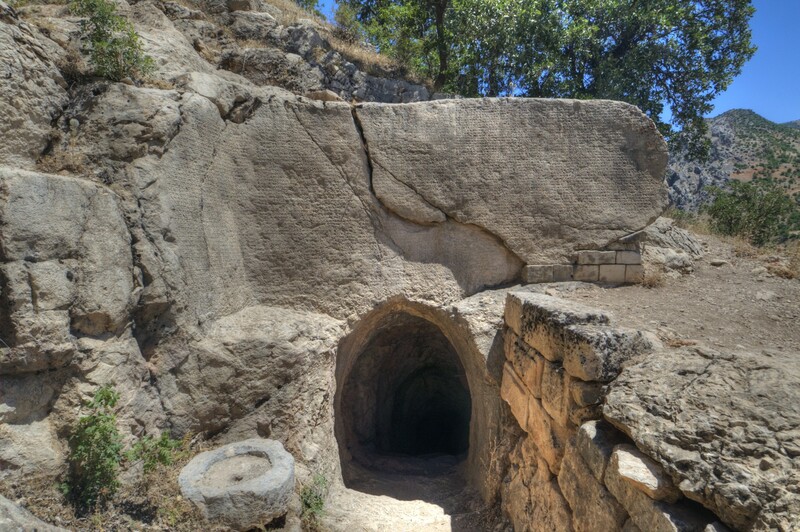 Unlike the hierothesion on the Karakuş Tumulus, Arsameia was not just a burial place for the royal family. The Kingdom of Commagene had three main cities: Samosata and two Arsameias. Samosata was founded in the 3rd century BCE by Samos, a Persian satrap, who gave it his name. However, during the reign of Antiochus I, its name was changed to Antiochia in Commagene, for the reason that seems to be obvious, especially in the case of a ruler suffering from incurable megalomania. It was the primary capital of the kingdom, but during the summer the ruler moved to the palace which was erected in Arsameia on the Nymphaios. A defensive wall surrounded the double peaks of the hill where Arsameia was built. 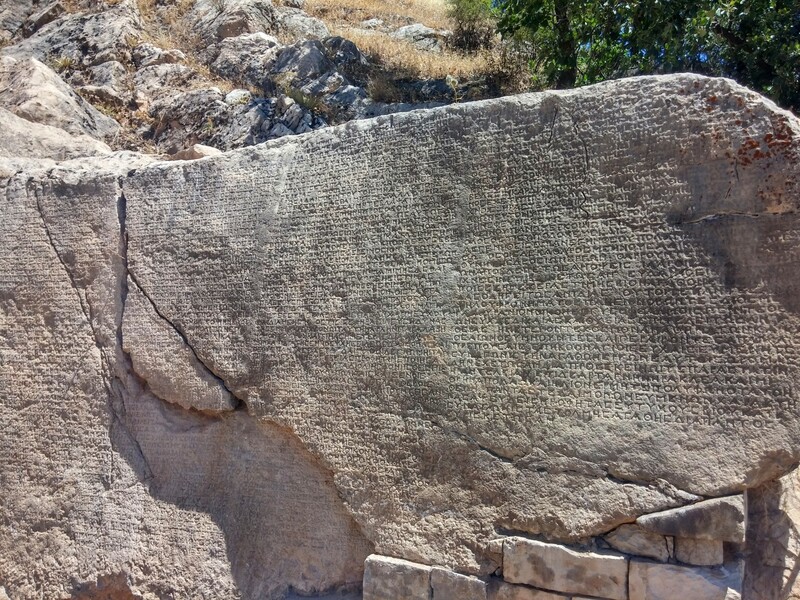 One of the inscriptions left by Antiochus I informs that he also expanded the palace, located at the very top of the hill. Arsameia was probably inhabited until the end of the Commagene Kingdom, that is the reign of Emperor Vespasian who included its territory into the Roman Empire in 72 CE. Soon after that, the soldiers from Legio XVI Flavia Firma used the buildings of this ancient city as a quarry. 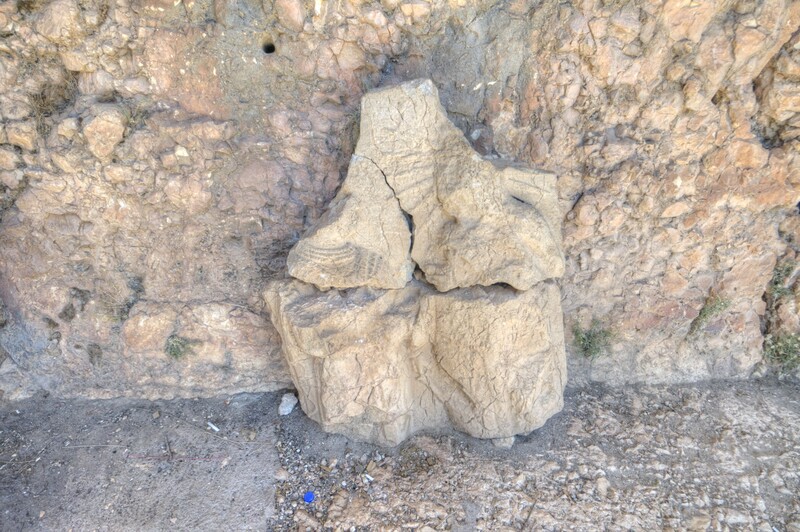 The materials were used for the construction of the Cendere Bridge, as were the columns from the Karakuş Tumulus. The existence of Arsamea was discovered by accident. In 1951, the German archaeologist Friedrich Karl Dörner conducted research on Mount Nemrut. A local person encouraged him to go to a place known in the area as the "Stone with a Picture". After a closer look at this specimen, Dörner stated that it was a relief depicting the god Mithras. 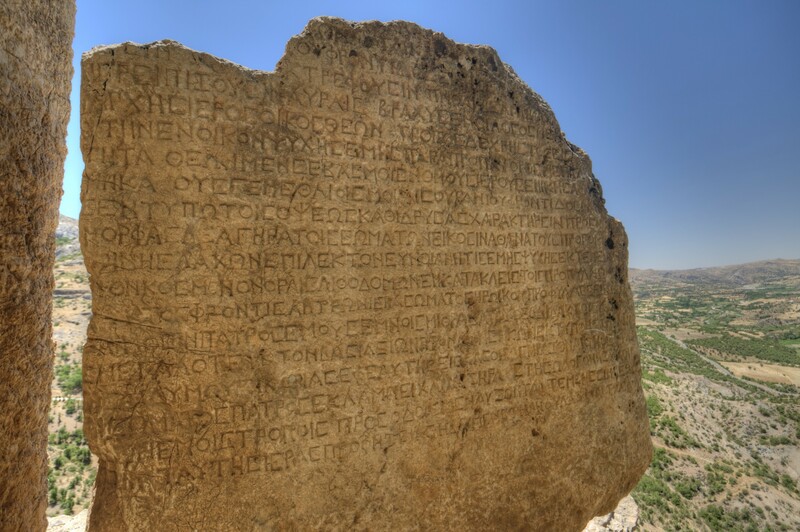 Further work allowed the unveiling of a well-preserved inscription that made it possible to identify the place as Arsameia on the Nymphaios, the summer capital of the rulers of Commagene. The first round of systematic archaeological work under the direction of Dörner began in 1953. 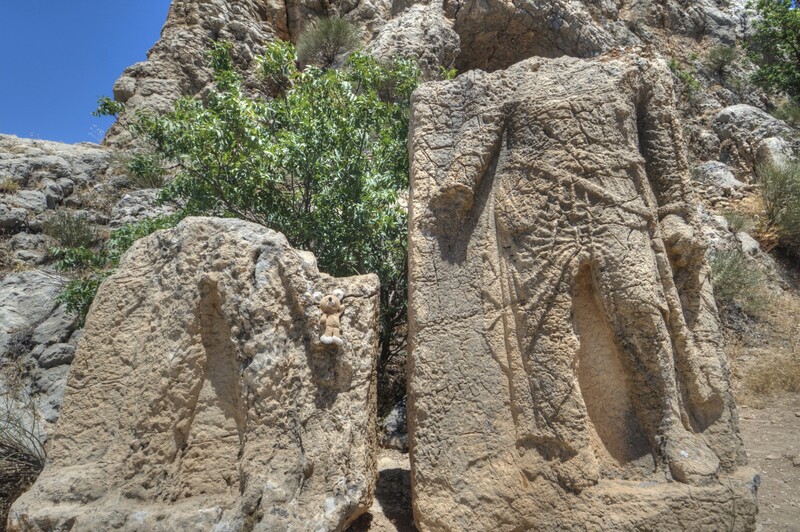 In the years 1953-1956 the Dörner team, in collaboration with American archaeologist Theresa Goell, discovered the currently known reliefs and tunnels of Arsameia. The sightseeing route of Arsameia leads steeply uphill, with a zigzag path that most likely coincides with the old processional route. The discoverer of Arsameia, Friedrich Karl Dörner, described the most important places on this route as Sites I, II, and III. However, for incomprehensible reasons, their numbering does not reflect the order of sightseeing. Going from the parking lot towards the west, first we reach Site II (37.942721, 38.656588). 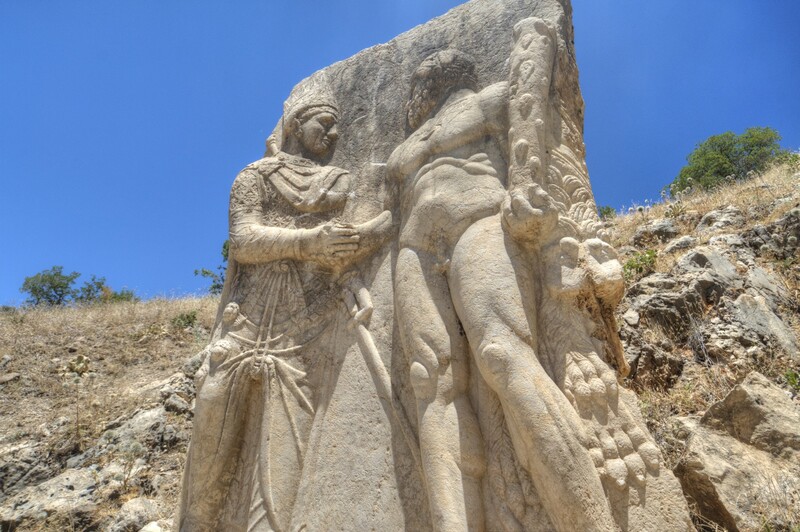 The most characteristic monument that is located there is the so-called the Mithras Relief that sparked the researchers' interest in Arsameia. Only its right half, representing the god Mithras, has survived. The relief shows the characteristic rays of the sun radiating from the god's head, because he was a solar deity. Mithras wears a Phrygian cap, originally associated with the Anatolian cult of Attis, the lover of the goddess Cybele. In Mithra's hand there is a bunch of twigs, known as barsom and used by priests in cleansing rituals. The back of the stone block, on which the figure of the deity was carved, is covered with inscriptions. Of the left half of the relief, only a fragment of an arm was found, which Dörner, his discoverer, identified as a royal arm, because of the style of the robes. However, it is not known whether the relief depicted Antiochus I or his father Mithridates I. The whole scene probably represented a handshake between a deity and a ruler. This type of graphical representation is called dexiosis. Many similar reliefs have been preserved in the Kingdom of Commagene, testifying to the megalomania of their rulers, who saw themselves as equal to the gods. The present appearance of the relief is the result of the reconstruction carried out by Dörner, who reassembled the lower half and the upperquarters of the god Mithras. Continuing the walk westwards, we come across Site I (37.942936, 38.655357). In the mountain slope, there are several natural caves used by people in prehistoric times. 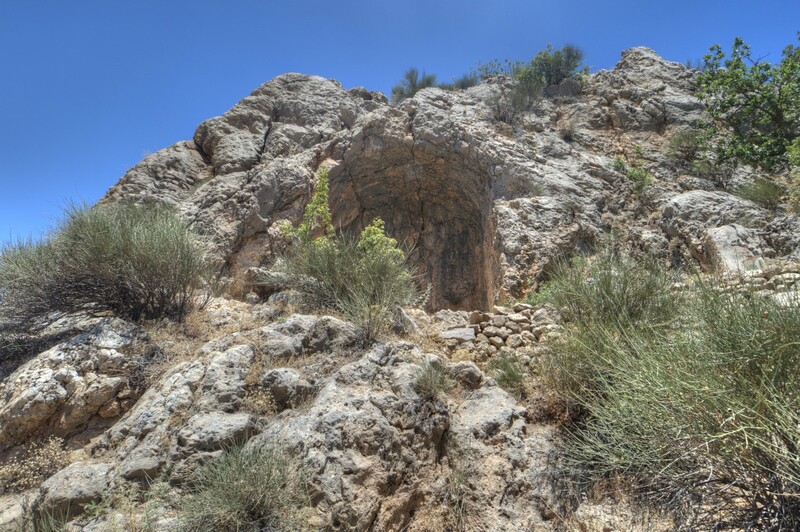 In addition, a monumental niche with an arched ceiling was carved into the rock. In the depths of the niche, there is a tunnel that leads down 14 steps to a vertical tunnel. Apparently, at its end there is a chamber on a square plan with the sides of 8 meters and a height of 9 meters. We could not confirm its existence during the visit, because for security reasons at the end of the stairs there is a solid trellis. As for the function of this chamber, the researchers are not in agreement. Dörner claimed that it was the temple of the god Mithras, i.e. Mithraeum. There are also theories that it was the burial chamber of King Mithridates I Callinicus. On the left side of the entrance to the tunnel, there is another relief depicting dexiosis, preserved in deplorable condition. Also in this case, it was possible to identify the god Mithras standing on the right, distinguished by a radiant head, while the character on the right has not been recognised by the researchers. In front of the niche, there are two blocks, on which reliefs of human or divine characters were carved in the front. Their side and back walls are densely covered with inscriptions. Behind Site I, the sightseeing route sharply turns eastwards to bring visitors to Site III (37.943325, 38.656036). 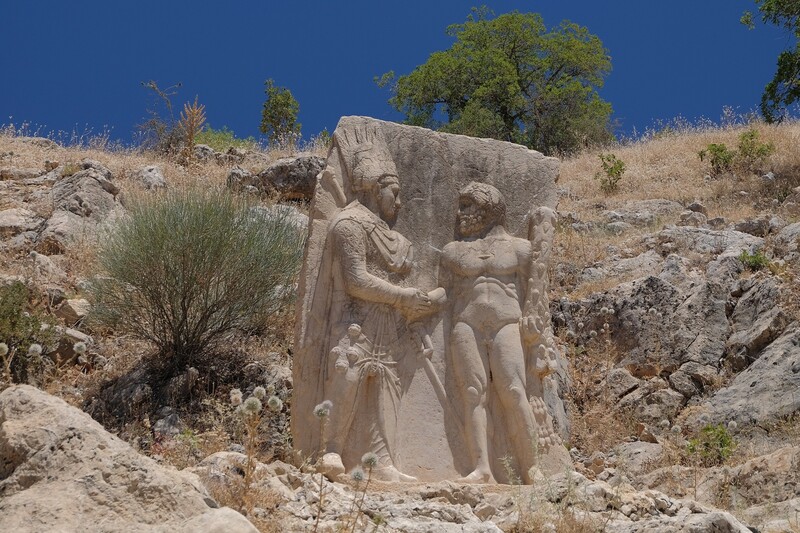 A steep climb up the hill is soon rewarded with the view of the best-preserved dexiosis scene in Arsameia - a handshake exchanged between King Mithridates and the mythical hero Heracles. Mithridates, standing on the left, is clothed in magnificent robes, and he wears a kitaris - a tall crown, characteristic of the rulers of ancient Armenia. He shakes the hand of naked and bearded Heracles, who can be easily recognised by his famous club. Slightly below this relief, there is the entrance to a tunnel. The inscription above it, written in five columns, contains the history of the founding of Arsameia and the construction of the hierothesion on its territory, instructions for the proper performance of religious rituals, and the titles of Antiochus, Mithridates, and the queen Laodice, the daughter of Antiochus. Antiochus himself is mentioned here as Ἀντίοχος ὁ Θεὸς Δίκαιος Ἐπιφανὴς Φιλορωμαῖος Φιλέλλην, i.e. Antiochus, a just, eminent god, friend of Romans and friend of Greeks. Thanks to the fact that the inscription was underground since antiquity, it is in excellent condition. The already mentioned tunnel was carved in the rock for a purpose unknown to us. 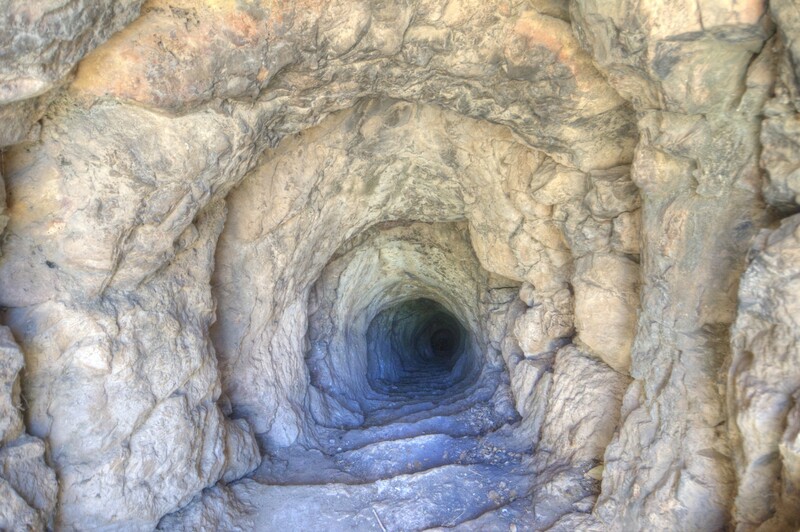 It is almost 160 meters long and goes deep into the earth. This tunnel is unsecured and courageous adventurers can go down to its end, descending on steep steps. However, this is a dangerous task because the tunnel lies in total darkness. Therefore, a flashlight, as well as proper footwear, are essential, as some of the steps are very worn, and the tunnel is sometimes flooded. After covering the first 50 meters, the tunnel becomes lower and steeper. In the end, unfortunately, there is no pleasant surprise, just stones and fragments of pottery, plus modern candy wrappers and plastic bottles that came down to the bottom together with rainwater. 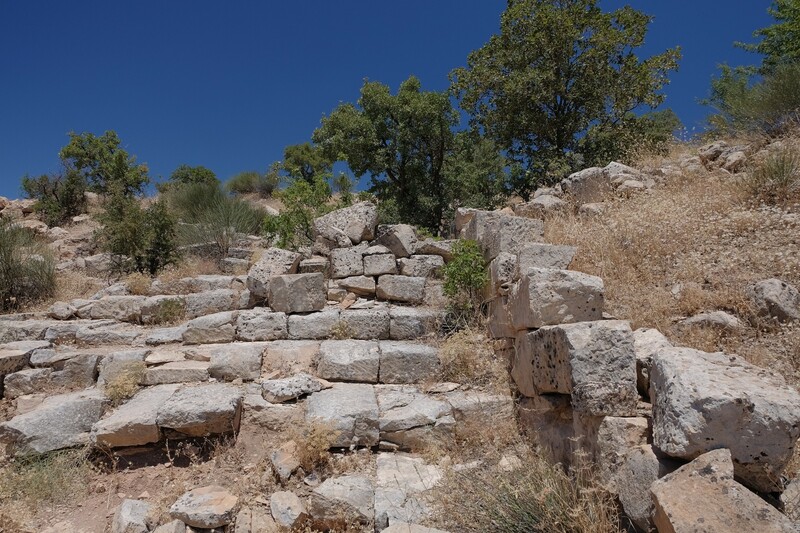 Behind Site III, the path turns sharply westwards and continues steeply uphill to the Acropolis (37.943759, 38.655409). Foundations of buildings were found there, with floors decorated with mosaics dated to the second century BCE. 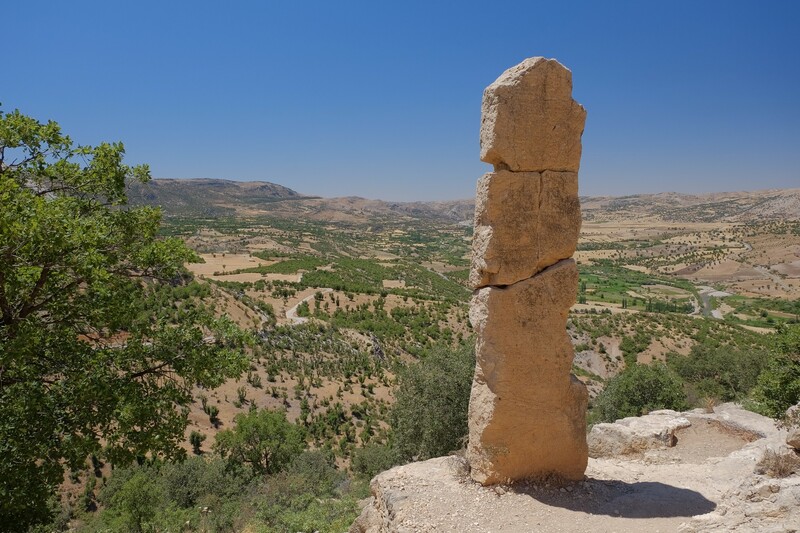 On the basis of the excavated fragments of sculptures depicting King Antiochus I and his mother Laodice, Dörner put forward the theory that there was also a mausoleum of King Mithridates in this location, decorated with these statues. It is certainly a place worthy of a king, with a great view of the area. Because in the case of other known Commagene hierothesions - Mount Nemrut Karakuş Tumulus - the rulers of Commagene were buried close to the peaks, Dörner's theory seems to be better justified than the claim that Mithridates rested in the niche of Site I. In 2017, the situation with the entrance fees for the Mount Nemrut National Park looked unclear. At the entrance to this area, before reaching Arsameia, there was an empty booth, and the barrier was raised. The site of Arsameia was guarded, but no fees were collected. However, the guard followed our team from one site to the next, probably to look after the monuments. At Site I, he rested in the shade of the stone niche, then caught up with us at Site III, where he slipped on the stones and fell. After this accident, the guard gave up and went back down to the booth, and we could peacefully visit the Acropolis of Arsameia. From the top of Arsameia, you can clearly see the Mamluk fortress, called Yeni Kale or New Castle. This name is to distinguish that location from the Old Castle (Eski Kale), that is Arsameia itself. 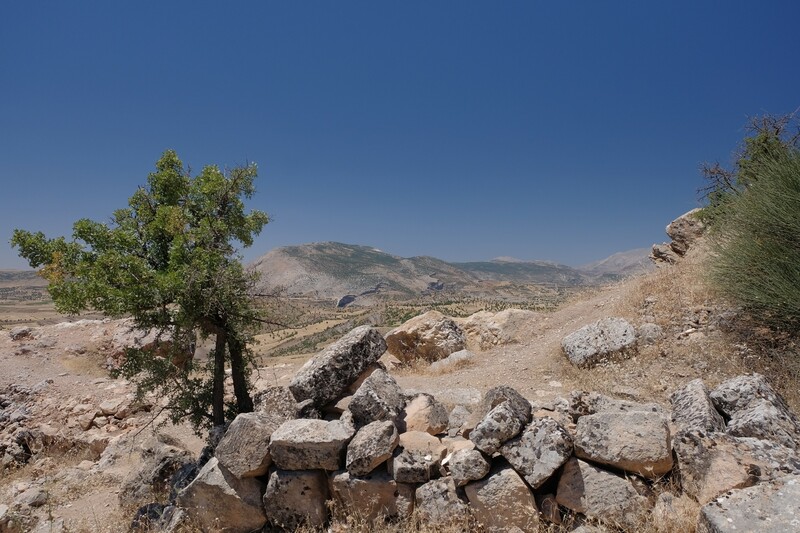 Looking around in another direction, you can easily spot Mount Nemrut. 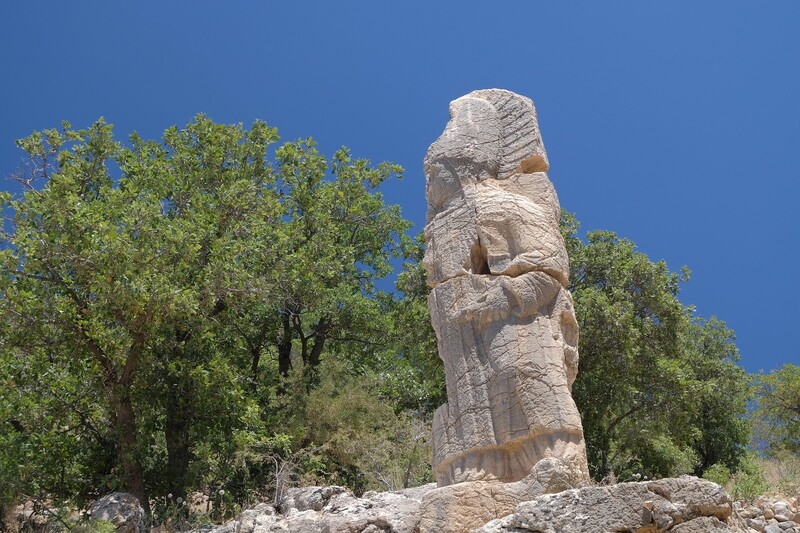 To get to Arsameia, take the right branch of the road (37.944113, 38.648136), during the drive from Cendere Bridge to Mount Nemrut. The left branch leads to the Mamluk fortress of Yeni Kale.